Political gadfly Ros Sarom likes to take on the government, filing high-profile complaints against officials and parties, one after another, even though all of his previous efforts have fallen flat. As president of the Victory Intelligent Standard Association, of which little is known, Mr. Sarom dreams big. His latest plan is to mobilize 100,000 people to deliver a lawsuit seeking to dissolve the ruling CPP for violating the Constitution. He does not say how he will recruit the masses or obtain permission for them to march to the Supreme Court to deliver it. 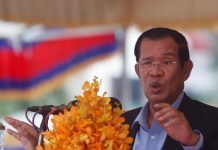 The lawsuit will claim the CPP violated the Constitution when its lawmakers passed amendments to the Law on Political Parties targeting former opposition leader Sam Rainsy, Mr. Sarom said Wednesday. “Our Constitution passed in 1993 says that all people have the right to join on the political stage,” but the new amendments barring convicted criminals from most political involvement contradicted that sentiment, he said. 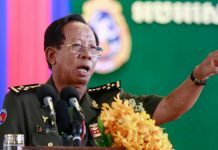 Mr. Sarom also claimed that the former leaders of the CPP included Pol Pot and were national traitors, in spite of the fact that Prime Minister Hun Sen and other senior party leaders helped overthrow the Khmer Rouge leader. “What I am doing is not an insult against the CPP…but is just finding clarity for the CPP whether this party had leaders who were traitors or not,” he said. CPP spokesman Chhim Phal Virun seemed disinterested in the lawsuit. Mr. Sarom last made headlines in June last year, when the Anti-Corruption Unit (ACU) declined to investigate his claims of nepotism in the National Election Committee’s hiring practices. Mr. Sarom confirmed that he later apologized to the group. workers to allow them to register to vote. None gained any traction.